Constructers of a highly publicized tourist site cannot be contacted. A new tourist site which was opened last week - namely a suspension bridge connecting the village of Simeiz with the Rock Diva - does not work anymore. According to eyewitnesses, during a strong wind a couple of days ago the construction went out of order. Since then, the passage to the bridge is prohibited. The term of repairs or reopening is not known. The source specifies that Anri Kanunov, the Chairman of the company Freerate, which implemented this project, does not answer the calls. 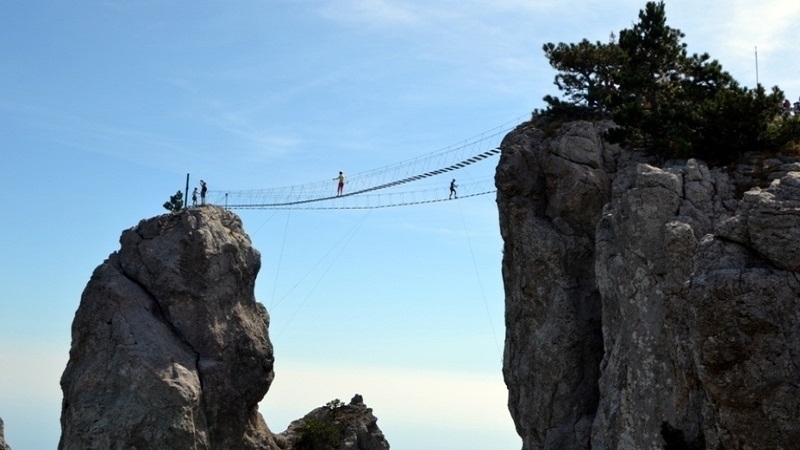 Previously, Crimean media reported that the longest suspension bridge in Crimea (about 100 meters) was opened on the cliff of Diva in the town of Simeiz. Then, a zip-line - a steel rope for extreme descent through the air with the help of gravity - appeared next to it. Use of the bridge and zip- line was offered for 800 rubles. PHOTOS: Twitter Roksolana Today & Crimea, "Arguments of the Week Crimea"